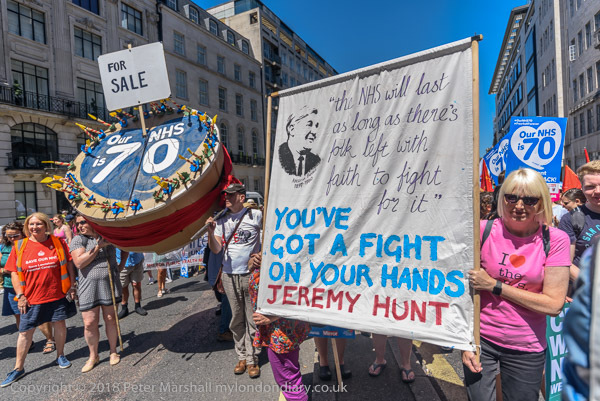 I was born before the start of the NHS but it has been there for almost all of my life, there when I’ve needed it. Some of my earliest memories are of going to the clinic where my mother was given free orange juice, which I loved, though I remember it as being rather viscous and sweet compared to the orange juice I now drink every morning at breakfast. And they also gave her cod liver oil, which was rather difficult to get me to take, though I’m now sure it did me good. But even with this, we have moved far beyond the days of my parents, when the extraction of all of a person’s teeth and their replacement by a “full set” was a popular (and quite expensive) coming of age or wedding present. They woke every morning to see their teeth grinning at them on the bedside table in a glass tooth-mug, soaking in some tooth wash and part of the routine of rising was to put their teeth in. 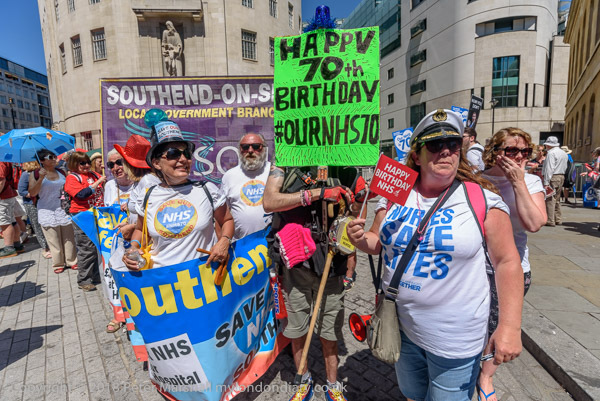 There have of course been many medical advances since July 5th 1948, and treatment under the NHS has improved greatly. When I think of the many treatments I’ve received over the past fifteen years that have kept me alive and more or less fit to work, about the only ones that would have been available back in 1948 were aspirin and the concerned care of doctors and nurses. There have been some set-backs too. Many were appalled at the introduction of prescription charges by the Conservative government in 1952 (the 1949 Act by a Labour government had made this possible – and led to Bevan’s resignation.) They were free again for three years in the 1960s and are now £8.80 per item, 176 times the 1952 rate, though actually rather greater than this as the initial charge was ‘per form’ and since 1955 it has been ‘per item’. The amount these charges raise is relatively small in terms of the NHS budget, perhaps around £400m, mainly because almost 90% of prescribed items go to those of us who qualify for free prescriptions. While prescriptions are now free for people living in Wales, Scotland and Northern Ireland, our current government has announced a crackdown on faudulent claims for free prescriptions in England, an expensive sledge-hammer to crack an insignificant nut. Many of those currently accused of having falsely claimed to be eligible are found to actually qualify for exemption, but have simply not applied or not kept their paperwork up to date. The prescription crack-down is perhaps simply and example of the general Conservative apoplexy at the idea of people getting something for free that they or their friends could be profiting from. 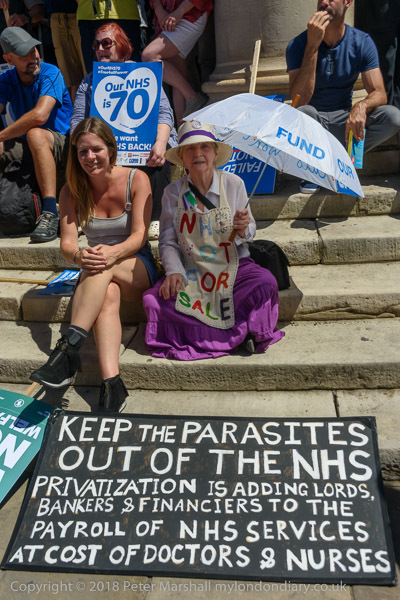 More and more aspects of our NHS treatment are now being handed over to private companies to deliver, and the NHS is continually being weakened by this back-door privatisation, sliding slowly into the hands of healthcare businesses. And once this process is more or less complete – unless we get a government that reverses it – those companies will be keen to go further, to move to a US-style insurance-based system with exorbitant medical costs and people being turned away because they have conditions their insurance does not cover or because they have been unable to afford the insurance payments. 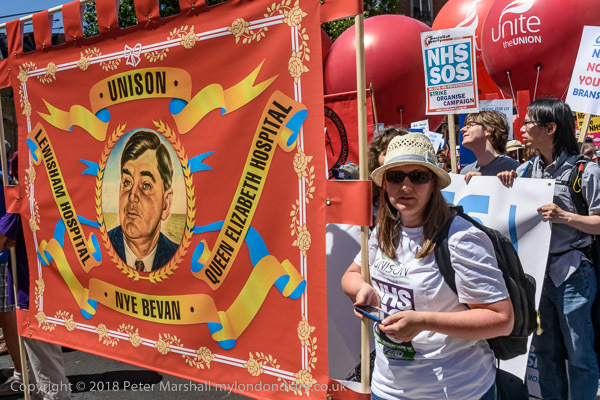 Aneurin Bevan never actually said “The NHS will last as long as there’s folk with faith left to fight for it” though he certainly did say that people would have to fight to keep it and its principles alive. 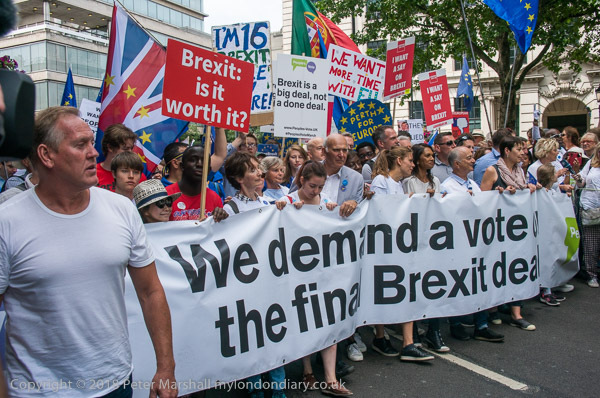 At no time in its history has it been so much under threat as now, and this march showed that there were still people prepared to fight for it, though it is hard to be confident that we will win. I’m hopeful that it will see me out, but fearful that its demise might see the death of me. Two unrelated issues, the first rather brief. Firstly a reminder to those – like me – who have yet to adjust the time settings on your cameras to do so without further delay. On my Nikon cameras it only takes a few seconds to go to the Setup menu, select Time Zone and Date and turn Daylight Saving Time to OFF, but it takes a little longer to find anything on the Fuji menus, once you have made them appear on the rear screen. If you have the Local time set for Daylight Saving you then simply have to select Home. I got up in the middle of my typing above and made the changes on the four cameras I frequently use. Job done until we get the light back next year. Secondly, photographing buildings, something I was reminded of by an image I shared with the previous post – and here it is again. I’ve just come across a very clear answer to the question of copyright at the IPCopy blog so far as UK law is concerned – with a clear statement that “there is an express exception to copyright infringement under the CDPA 1988 which allows photographs or indeed a film to be made” and to be published in any way of any building in the UK. So far, so good. Unfortunately the answer goes on to say that in some cases “in some cases permission may be required to use the photograph” and goes on the mention the Committee of Advertising Practice Code. You can actually find this advice on the ASA web site, where it basically states that buildings and general public locations can be used “without permission so long as they do not denigrate the building or area in question.” It goes on to state that recognisable properties owned by “members of the public” require permission. Perhaps the main area that the IPCopy post does not make clear is the matter of Trademarks, which I’m sure they know far more about than me. The most interesting discussion I’ve come across of this issue is The London Skyline – an IP view by Leighton Cassidy and Beverley Potts of Fieldfisher LLC written in 2016. In the section on ‘Corporate Branding’ they discuss the use of trademarked buildings suggesting that limitations only apply if the photograph uses the building as a trade mark, or relates to similar goods and services or dilutes or profits from the reputation of the brand. Although it seems to me that none of these could apply to editorial or most artistic uses of the image, some trademark owners have clearly adopting a bullying approach, threatening any use with expensive litigation. And photo agencies have allowed themselves to be browbeaten into the strictly unnecessary removal of some images. UK copyright law also has specific exceptions to allow us to photograph and publish pictures of sculptures, models of buildings and works of artistic craftsmanship permanently situated in a public place. I’m not sure what constitutes a ‘work of artistic craftsmanship’, but the legislation makes clear that this does not apply to paintings or literary works, so all those millions of internet posts of graffiti (almost rivalling cats) are at least technically copyright infringements. Though I post some on my own web site, I don’t generally file them with agencies and some at least will not accept them. And I run a cat filter on my Facebook feed. Unless of course the copyright material is included incidentally, though exactly how that should be interpreted is unclear. Perhaps as a rough rule of thumb you might ask yourself if you would have taken the photograph had that material not been present and if your image focuses (not necessarily literally) on that material. Fortunately also in the UK we have a copyright system where any damages are compensatory rather than punitive, which greatly limits the desire for litigation. 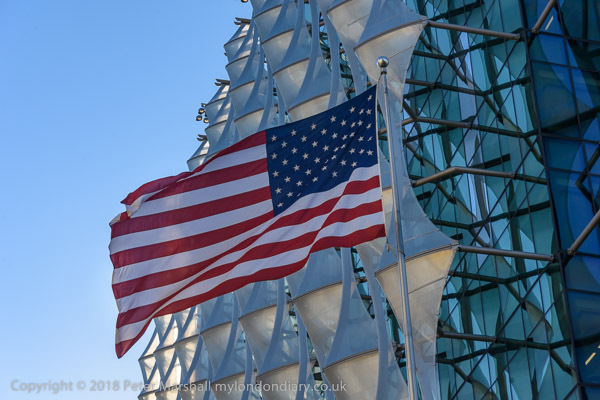 So, aside from a few specific limitations covering military and similar sites you should feel free to photograph any building in the UK (or more or less anything else) and generally to publish those images for non-commercial uses. For commercial use, you and any client need to think more carefully – and I would be very wary about signing any indemnity clauses. But as always with anything involving the law I end with a statement that “I am not a lawyer” (IANAL) and you take my advice and opinions entirely at your own risk. 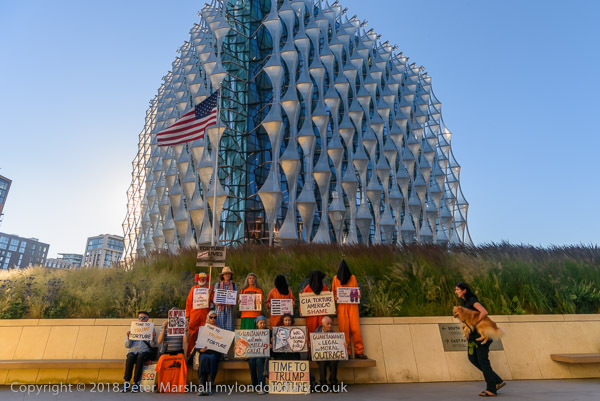 The trouble with protesting outside the new US Embassy in London is that almost nobody sees the protest. The area around is still something of a building site, and even when the tall blocks of flats around are completed and sold, relatively few of them will be inhabited, with many going as investments to overseas investors, few if any of whom will actually ever live there and many will never even visit. The path around the embassy leads nowhere; only those going to the embassy on business will use it, and the protest I was going to photograph was timed for after the embassy was closed. 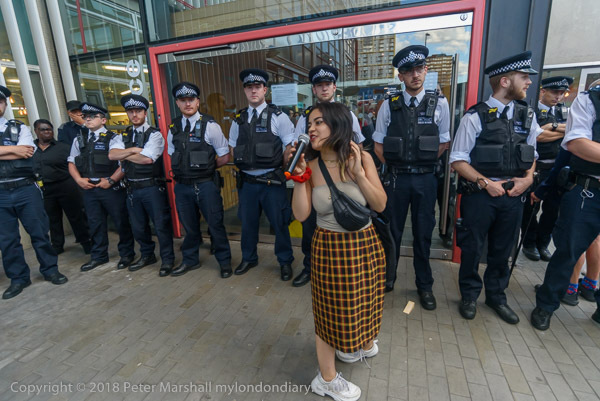 The only people who came to see what was happening were the police and security on duty, as well as one embassy employee in a suit who came briefly and took a few photographs. 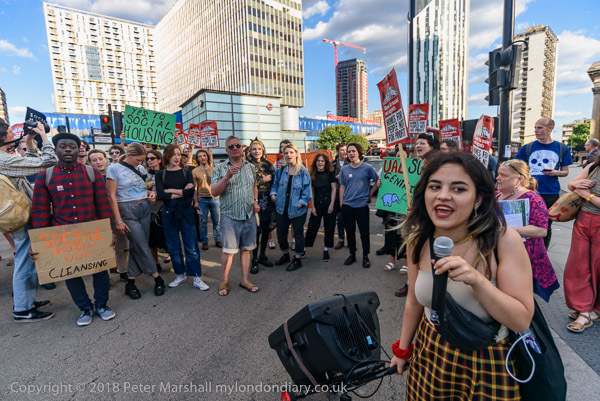 So my photographs – and those taken by some of the protesters – are the only public face of the protest, and while mine have appeared on Facebook and on my own web site, as well as on the site of the agency I sent them to, they have not yet been sold for any use. 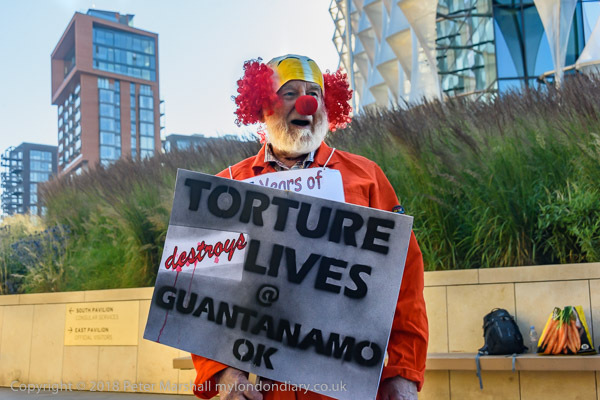 Guantanamo is no longer considered news by the media, and there are no longer any detainees with a UK connection that might make them so for the UK press. It would be slightly more public to hold this and other protests on the main road in front of the embassy, but it is set back well from the road, and some of the connection would be lost. 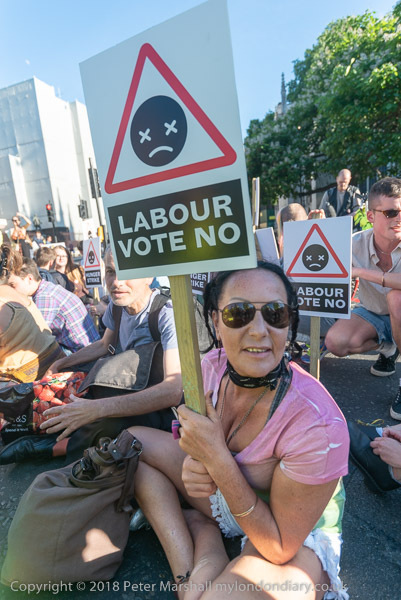 But at least the protest would be seen by those going along the road, which at the rush hour does have a number of pedestrians, cyclists, cars, buses and other vehicles passing – rather busier in total than the old venue in Grosvenor Square. 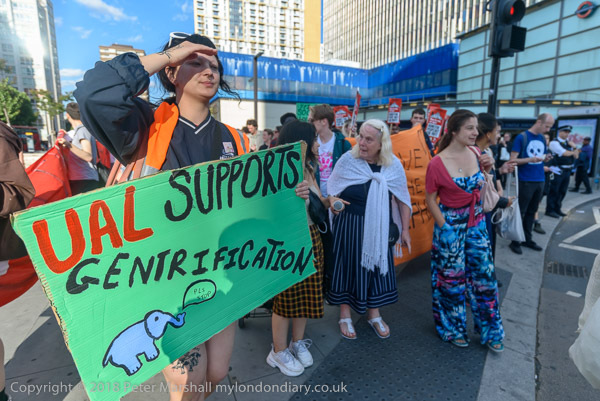 Or perhaps there is somewhere ele in London sufficiently connected with the US as to be a suitable site for protest? So while the protesters put in time to make their way to this rather out of the way place, and I worked hard to exploit the visual possibilities of the situation – in some ways rather more exciting than Grosvenor Square, if nobody actually sees the protest itself or the photographs, our time and effort is rather wasted. 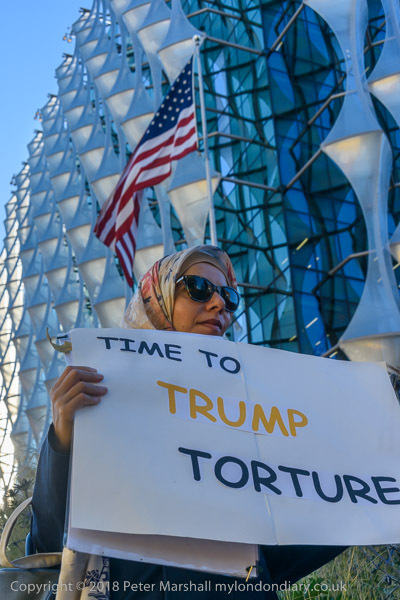 Torture continues at Guantanamo and I fear this and similar protests will have little effect in stopping it. 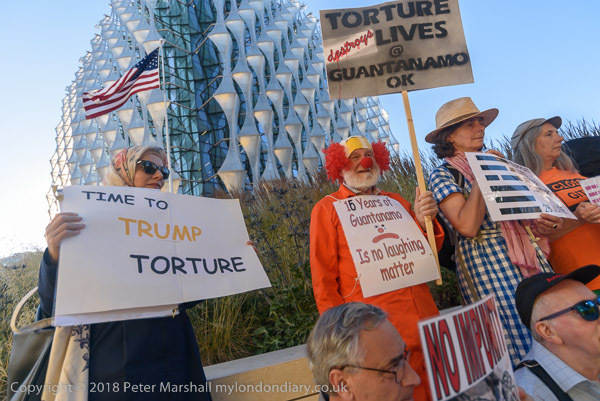 You can see more pictures from the protest at Torture protest at US Embassy and please feel free to share the pictures and this post. 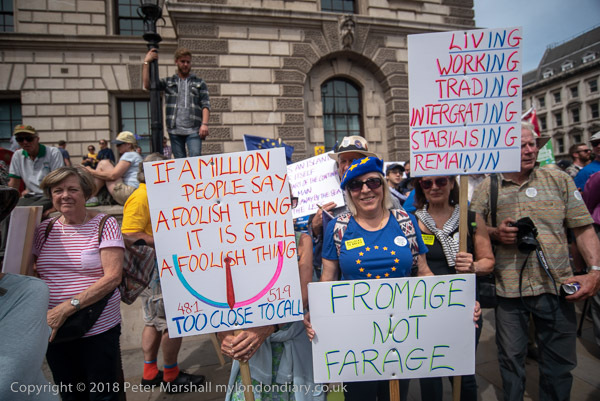 The images (except for the top one, which I didn’t send as it wasn’t a part of the protest) are available for editorial use from Alamy though almost impossible to find through their rather opaque search system. 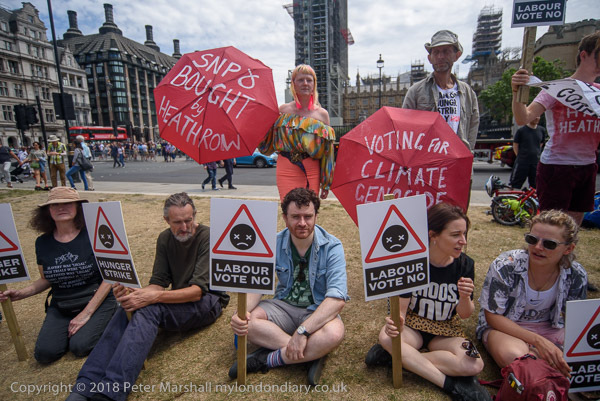 Although the arguments for building an extra runway at Heathrow seem now to be even weaker than when it was ruled out back in 2009 and those of us who live near the airport celebrated, and the arguments against far clearer, well-funded lobbyists have managed to put it back on the political agenda, reviving what seems clearly a corpse. Politically it is quite a curious mixture, with some trade unions supporting airport expansion, along with aviation industry figures. 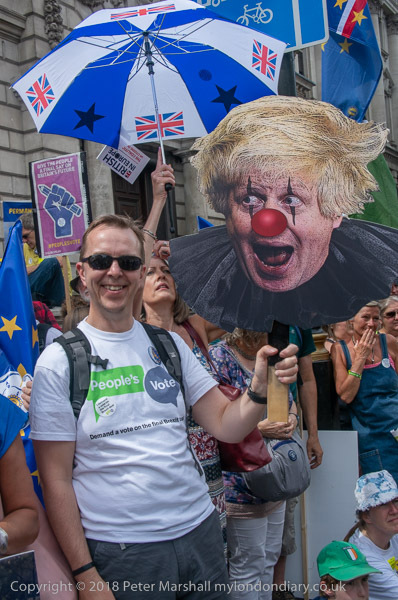 Brexit has also played a part, with prominent Brexiteers supporting expansion as necessary to increase our trade with the rest of the world after we leave Europe, though Boris Johnson who opposed the third runway when Mayor of London, and is now MP for Uxbridge, which would be adversely effected has promised if necessary to lie down in front of the bulldozers. Of course, as he was then Foreign Secretary and thus a part of the cabinet he would have been obliged either to vote for the Government motion or resign when the vote came on the Monday after these protests – and he conveniently found some mythical Foreign Office business to take himself out of the country. 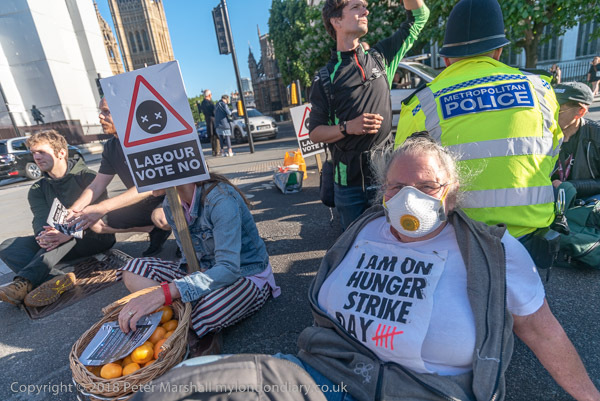 A small group of people had been protesting with a two week hunger strike outside the Labour Party HQ (though they had been elsewhere when I went to try and photograph them) and most of them came to take part in both the Friday evening protest and on Saturday. 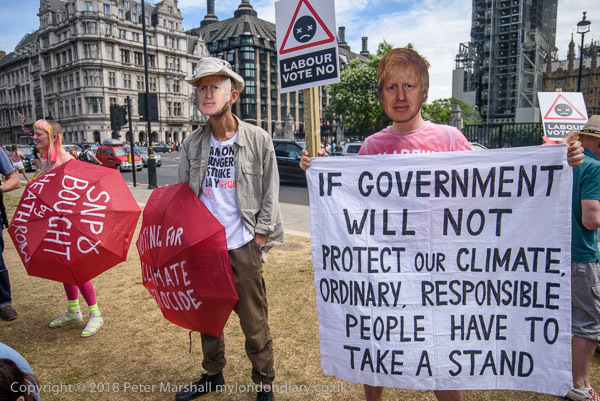 The recent report by the Intergovernmental Panel on Climate Change will I think change the game so far as aviation is concerned – as well as on many other issues, forcing even our current government to take more environmental issues far more seriously. 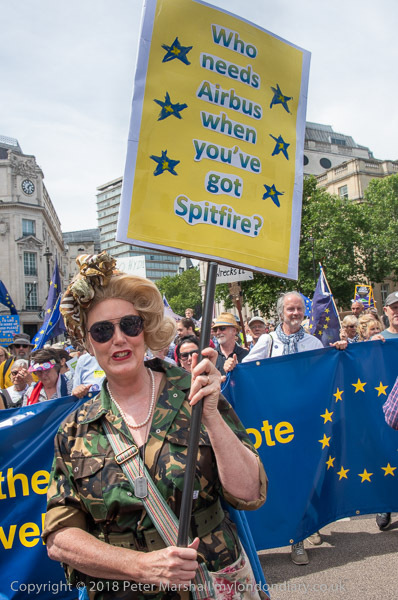 Aviation is of course a global issue, and there will be considerable pressures from many other countries which are likely to make the growth forecasts on which the Heathrow decision was based totally absurd. 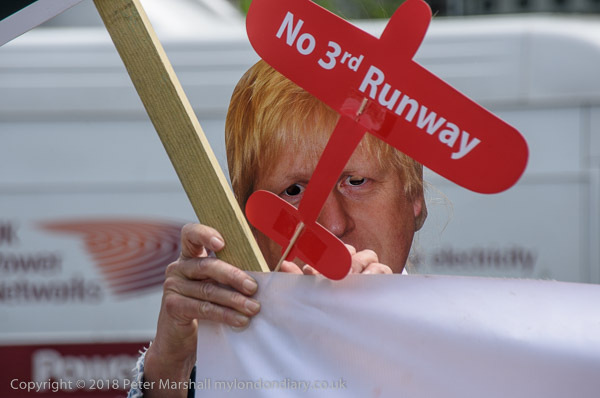 Despite the vote which came on the Monday following these protests it is very unlikely the third runway will ever be built. 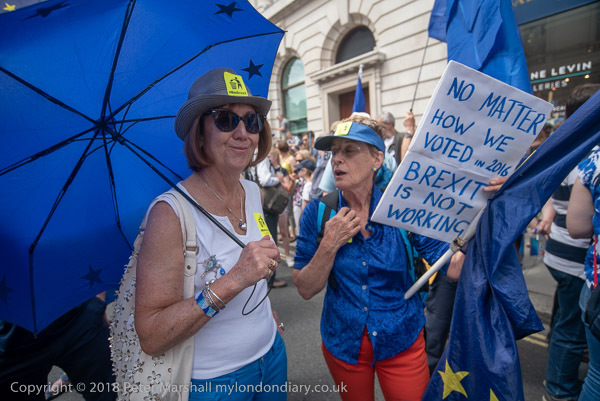 Brexit and the economic crisis that will precipitate will almost certainly lead to its cancellation on cost grounds, and the disruption the building would cause to traffic around London is unthinkable. Politically also any attempt to go ahead with the project on the ground is likely to be impossible, and it seems almost certain that the next government – of whichever party or coalition – will reverse the decision. 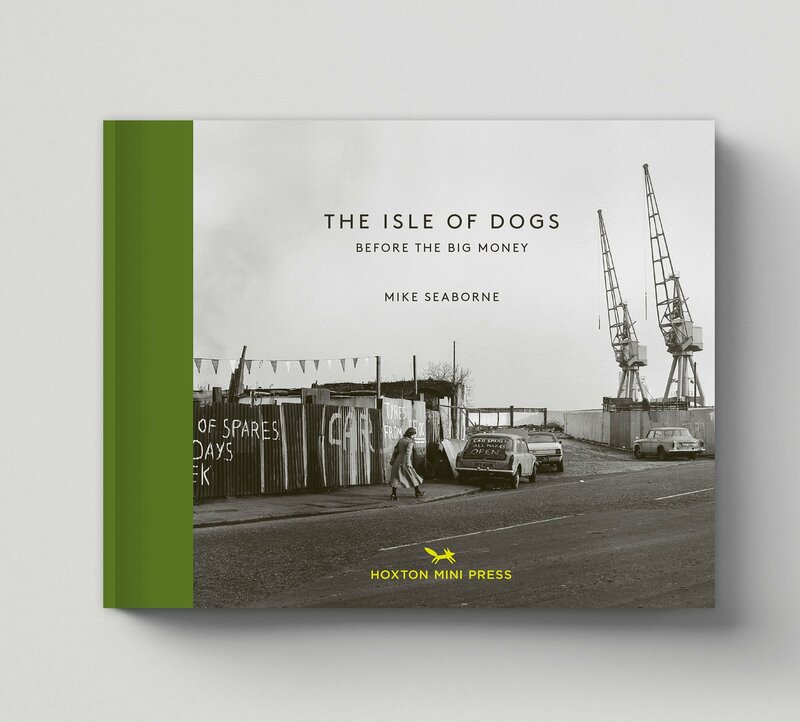 Thursday night last week I went to the launch of Mike Seaborne‘s book, ‘The Isle of Dogs: Before the big money‘ appropriately held on the Isle of Dogs in Cafe Vert at George Green’s School, a few yards from Island Gardens DLR station. Mike is an old friend who I met not long after he was taking the pictures in this book, and we then found that we had both been photographing the area at the same time. 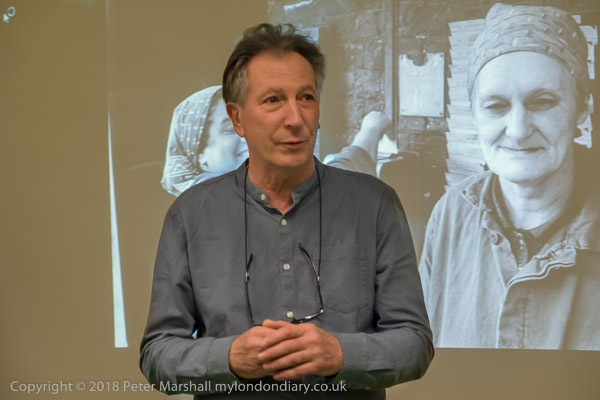 But while I was just an occasional visitor to the area with a general interest in what was happening across London (and in across Docklands in particular), he became very much more involved in the community of this particular area, as this work shows. 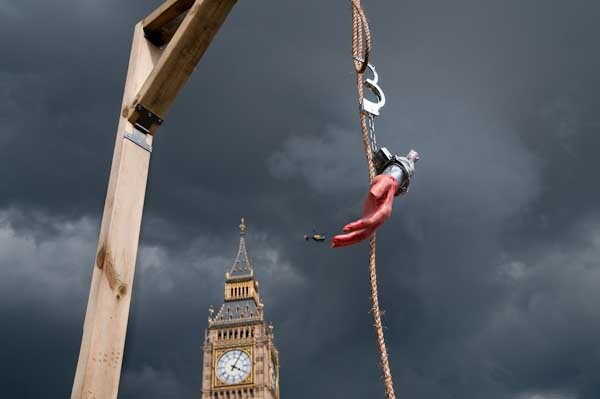 Of course, as you can see from his web site, he has also photographed widely across London and elsewhere. and of course you can buy a copy on-line. 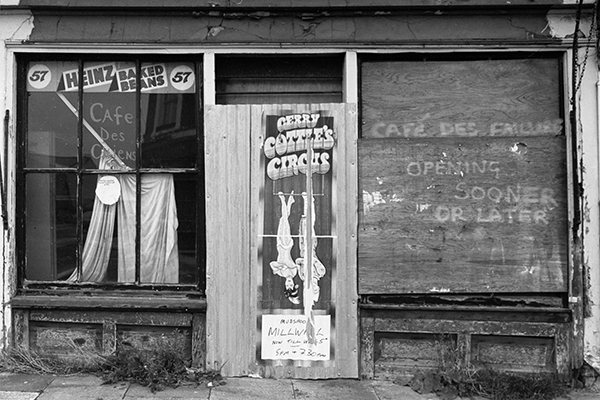 Mike began to photograph London in 1979 and until 2011 was Senior Curator of Photographs at the Museum of London. 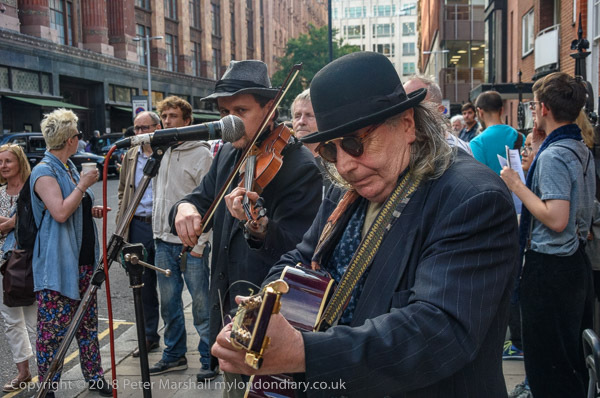 A group of photographers including Mike and myself have also organised a number of shows over the years, and you can still see work from several of these, including ‘Another London‘, on the web, and much more of Mike’s work on his own web site. Back in 2002 we set up a site together to celebrate Urban Landscape photography, featuring our own work and that of other photographers from the UK and around the world. you can see Mike’s in his book, and also on his 80sIslandPhotos. Mike has continued to be involved with the community he photographed back in the 80’s and this was evident at the opening, from which I’ll perhaps post a few more pictures later. I didn’t warm to Julian Assange as a person when I briefly met him in 2011, but I guess he had other things on his mind. But when various allegations were made about his conduct with women in Sweden it did seem that a case was being constructed on rather flimsy ground – and later dropped – to try to enable the US authorities to get their hands on him. They wanted to lock him up in isolation for life for revealing illegal and immoral activities by the US military and security services to the world. 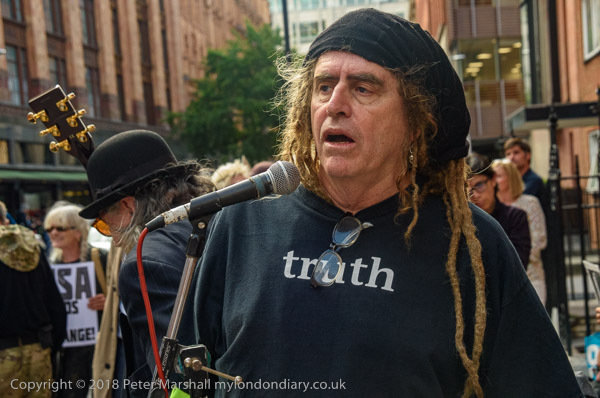 It came as a surprise to realise that Assange had been inside the Ecuadorian embassy in London for 6 years on 19th June 2018, though I have been there a number of times and photographed his supporters on the pavement opposite. Our government is too scared of upsetting the USA to allow Ecaudor some way to fly him to their country and has spent huge sums on security to prevent this happening. Ecuador has come under increasing pressure from the US to hand him over, and have for some months been refusing access to him and have taken away his internet connection – though recently announcing some limited access following a visit to the country by the UN Special Rapportuers for Freedom of Expression & Refugees, this does not yet appear to have been implemented. 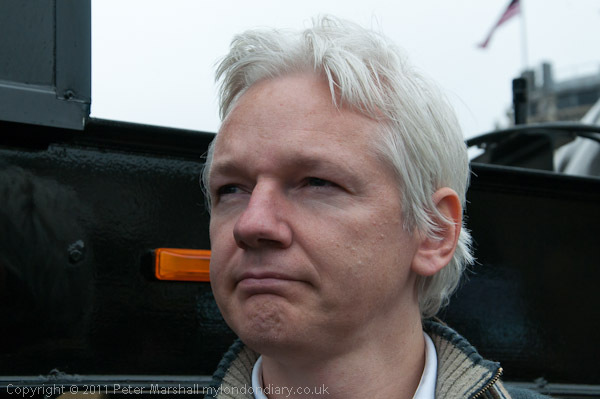 The BBC has been accused of publishing fake material and misleading statements in many of its reports on Assange – and certainly along with most other UK media has adopted a very negative attitude towards him. A recent article on the BBC website about the lengthy Special Protocol recently imposed by Ecuador on him quoted a statement clearly from a parody account as being by him. The new protocol appears to many to be designed to provide Ecuador with a pretext to withdraw diplomatic immunity in the event of some minor transgression of its draconian terms. 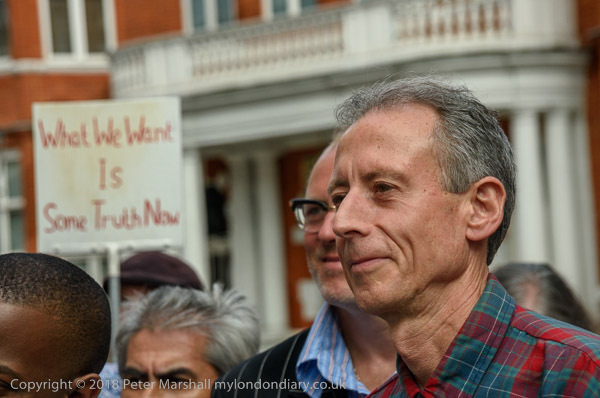 There was of course no sign of Julian Assange today, though Horvat Srecko, one of his friends and close associates did come to speak, and there were others there including well known peace and human rights campaigners, including Peter Tatchell and Ciaron O’Reilly. 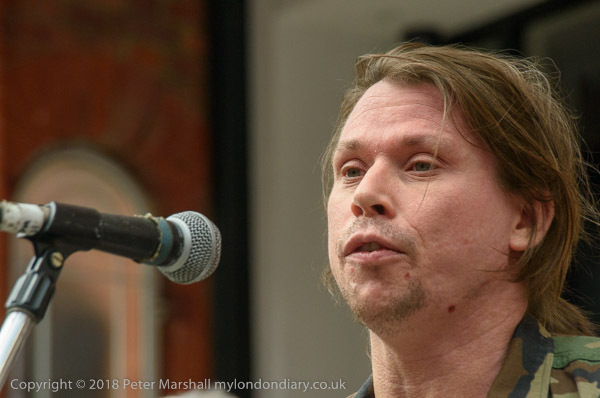 Also speaking at the event was Lauri Love who fought a long and succesful battle against extradition the the USA on hacking charges – and had he lost would now be sitting in isolation in a small cell for the rest of his life. 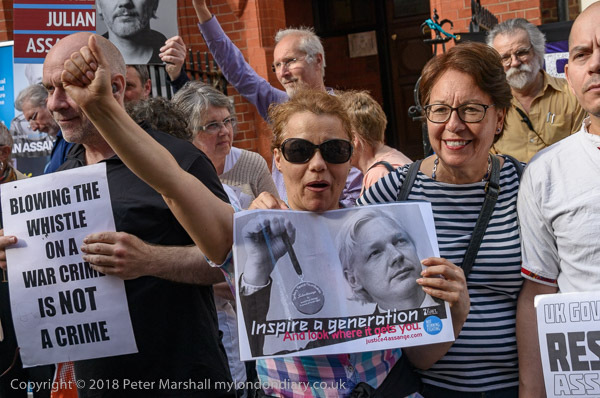 The even attracted a small crowd, including many who have regularly come to show solidarity with Assange outside the embassy. Among them were a number of Ecuadorians who urge their government to continue to protect Assange. Prince argues that by taking the images exactly as they were on Instagram, but enlarging them and adding his comment to put them on the gallery wall and sell them at high prices he was somehow producing a new original work of art, commenting on the process of communication involved in using social media – and Instagram in particular. As Gilbert writes, his approach is supported byome pretty serious names in the art world, with statements from a museum director, curator and well-known art dealer to the court. All of course people who profit in some way or other from artists like Prince. Prince of course profits from all the publicity this and other court cases give him, with many articles -including this one – in newspapers, magazines and blogs significantly raising his profile as an artist, and thus the prices and sales of his work. Perhaps the photographers whose work has been stolen might think about reclaiming it by appropriating Prince’s, producing copies of ‘his’ images, perhaps ‘transforming’ them by the addition of their signatures. I rather suspect Prince and his dealers would call foul and run to the courts in what would be a rather fascinating copyright case. There is of course absolutely no need for any of this. I’ve had my work used by artists – and they have come to me before doing so, explained what they wanted to do and we have negotiated a licence with an appropriate fee, and appropriate attribution. It’s an established way of working that avoids controversy – without misappropriation. But the very idea of stealing other people’s work seems to me to be the basis of Prince’s artistic practice. He’s famous for it. I don’t of course know what judgement the court will finally make – and Prince has got away with it in earlier copyright cases, though I hope at last it will be one that fully respects the rights of the photographer – and leads to them getting compensation for the use of their work as well as the legal costs of taking the case. Prince would still be the winner, with all the publicity from the case aiding his status and sales. The only losers – in the longer term – will be those who have paid high prices for what are works which will almost certainly be consigned to the dustbin of art history, lacking any real worth or interest. 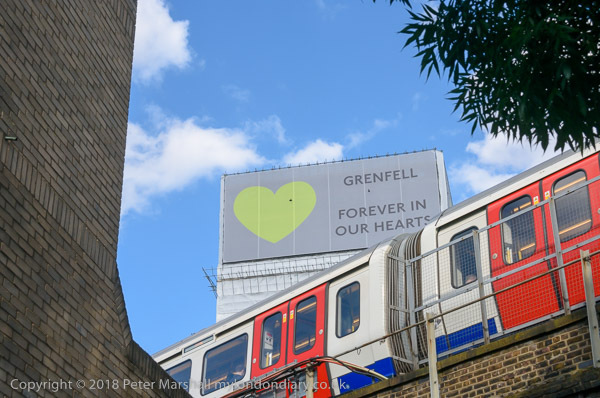 It was hard to believe it was a year ago that we all woke to the terrible news about the fire at Grenfell Tower – though those in the area had been up all night since it started early in the morning. 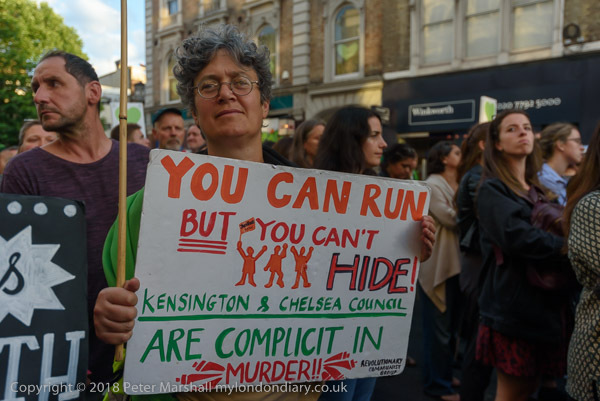 Hard to believe too how little has so far been done, at least by Kensington & Chelsea Council, the governemnt and official bodies either for the victims who survived the disaster or to seek out those responsible and to make sure that such a tragedy will never happen again. 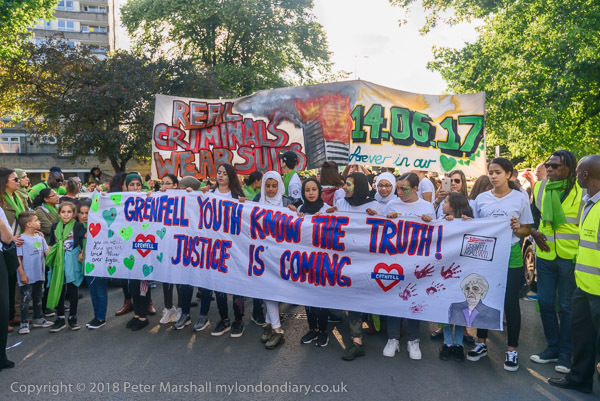 Clearly the authorities are hoping that the grass will grow long enough in time to hide the crimes that made Grenfell not just possible, but virtually inevitable. While it is right that the inquiry which finally started should look in depth at what happened, there are so many things that were obvious virtually from the day of the fire, and which we should not be waiting for years for action to be taken. There are things that could have been done virtually immediately. Promises that were made of urgent action – by the Prime Minister and others – which have simply not been kept. There should by now be people in prison, companies paying fines, councillors being banned from public office and more. The system has found it possible to try and jail a few people who tried to make false claims following the disaster, but somehow has not managed to take action against those responsible for it. Grenfell is not the only block that was waiting for disaster to strike. 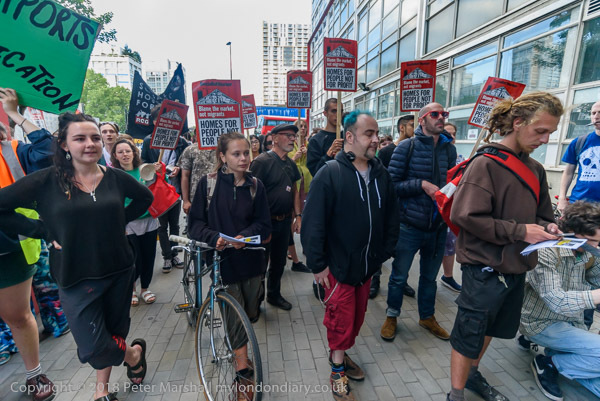 There are others with the same flammable cladding, others with inadequate fire doors, others with dangerous gas supplies, others without proper water supplies to fight fires, other fire authorities that cuts have lefte without the equipment to properly tackle high rise fires, without the manning levels to tackle major blazes. Others where councils and landlords have been able to avoid adequate safety inspections. 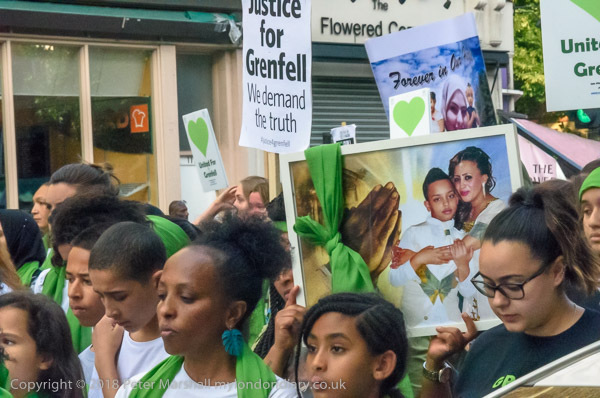 Probably Grenfell was an extreme example where a callous council and its TMO managed to bring all of these things together and to hide much of it from public scrutiny, but we should none of us be surprised to wake up to another dreadful news bulletin tomorrow or the next day. 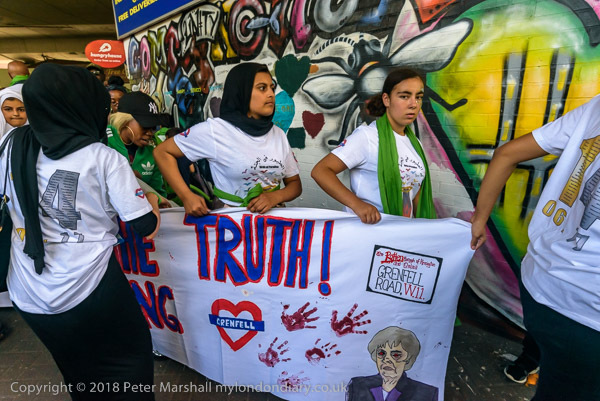 Grenfell was a warning that urgent action is needed; 14months on it is still needed. The community response to the tragedy was immediate and enormous and such a contrast to the authorities who should have done so much more. And more is even now coming out about the poisonous fumes and particles spread about the whole neighbourhood by the fire, which will have affected many more than those who escaped the tower and had to leave the adjoining blocks. 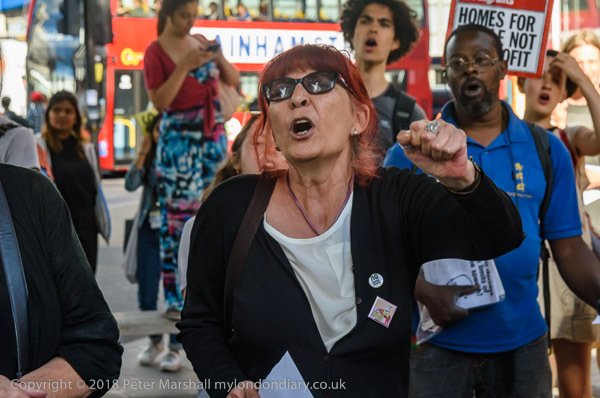 Then mental trauma many suffered – including many of the community volunteers – is also becoming more apparent, as is the continuing failure of the local council to respond adequately to the needs of those who suffered. And the community is still keeping the issues alive by its monthly silent walks, every 14th of the month. 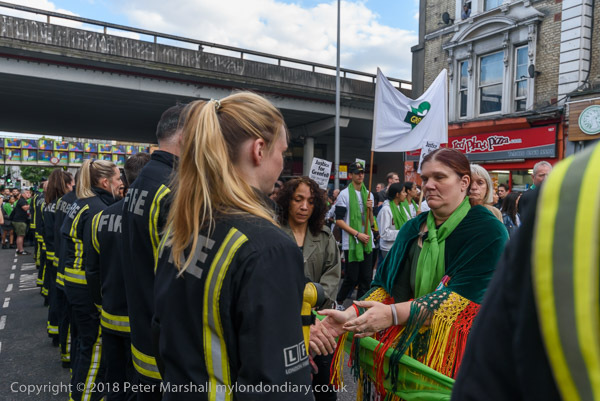 The June march was special, marking a year since the disaster, and an estimated 12,000 of us crowded there to make our feelings felt, wearing green fabric to show our solidarity with the victims. It was a moving event and one that was difficult to photograph, not just because of the crowds. I took so many pictures it’s hard to decide which to put in this post. 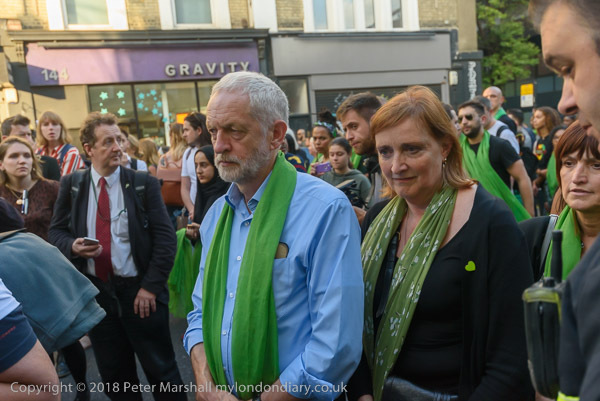 And I was there not just as a reporter but to show my own support, wearing a green scarf like the others, and for various reasons rather more emotional than usual. Together I think the pictures make a good account of the event, and the captions, some rather longer than usual, add to it. I left the march at Ladbroke Grove, as the organisers had made clear that the press were not welcome in the park where the march was ending, and walked slowly back to Shepherds Bush, though some of the wealthier parts of the area, feeling there should be millions not just thousands marching, and that we should all be angrier and more determined to see changes. 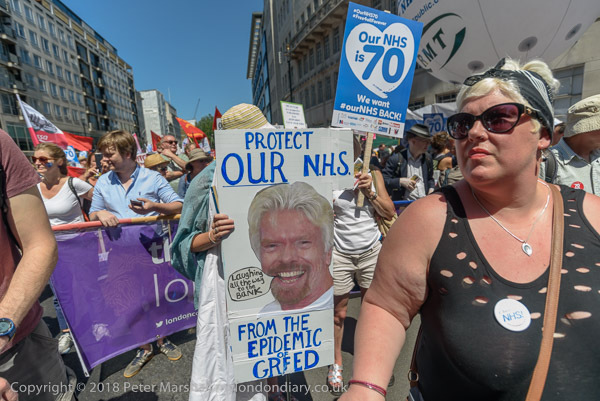 To borrow a slogan we do need a society that works ‘for the many, not for the few’ and one where people’s lives really matter, even if they aren’t among the wealthy elite. You are currently browsing the Re-photo blog archives for October, 2018.